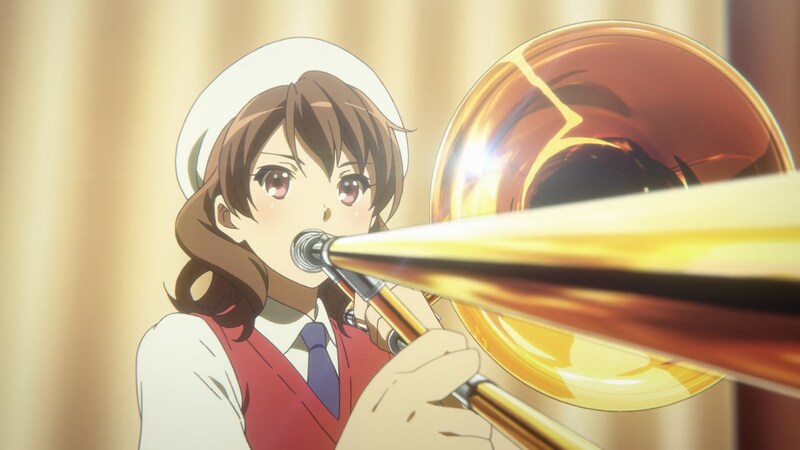 This time around Euphonium delivered a solid transition episode, elevated by grounded yet intense small confrontations and even more reminders that the series’ groundwork is excellent. Satisfying despite very little actually happening, and uplifting as it seems this final novel they’re adapting might regain the tight focus season 1 had. So allow me to entirely ignore all that nice content and talk about anime’s history, the ways audiences approach art, the roles of animators and directors, KyoAni’s training programs, and a bunch more of topics. I promise they all somehow tie into this episode. A few weeks ago I mentioned that Yoshiji Kigami was one of the main pillars at Kyoto Animation, but you can trace Noriyuki Kitanohara’s involvement with them around as far – and following similar paths as well, since he also was a frequent collaborator of Shin-Ei Douga at the time. And while he might not have been a transformative figure at the studio like his old companion, he definitely has been one of the names that have stood out over the years. When the need for animation muscle arises, Kitanohara always stands on the frontlines. He’s been in charge of rather memorable moments, and seems to have animated some of the wildest cuts they have ever produced. He has the grasp of nuanced character acting that the studio requires – as someone trusted to be one of Koe no Katachi’s chief animators, you can tell his ability to make drawings move in an expressive way is no joke. But he also possesses action dexterity he’s been putting to good use since before the modern KyoAni existed, giving him a rather formidable range. He’s even got experience as mechanical animation director, and would be one of the leading voices if they were to make a new robot show alongside people like Hiroyuki Takahashi. With this remarkable resume it’s no wonder he’s one of the top lecturers at the KyoAni School, guiding the youngsters who enroll on the animation course. But more on this later! Why so much talk about his abilities as key animator when he was the storyboarder and episode director, though? 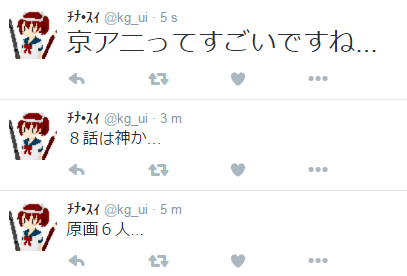 The reason is simple: Kitanohara is animator first, director later. It wasn’t until the studio began their independent adventures in the early 00s that he regularly started focusing on that field. Ever since then he has storyboarded and handled episodes in all their productions, but in this regard he’s more reliable than he is spectacular. And I don’t mean this in a negative way; when needed he delivers the kind of impactful layout only a gifted animator would consider, but for the most part effectiveness is all he has in mind. This leads to rather restrained output, which always feels very competent but isn’t overflowing with personality – and the preferences in that regard are an endless debate that perhaps guarantees a post on its own! For the most part, massively popular directors are highly idiosyncratic, but some of the best regarded individuals in the industry – like Madhouse’s Morio Asaka – are similarly dry yet unquestionably talented. Right after the episode’s broadcast I already observed this divide: animators who understand how hard it is to achieve that perfect balance amazed by what the episode accomplished with only a handful of artists; fans who felt it didn’t live up to the show’s usual fancy standards; viewers who loved it because there was no strong directional presence getting in the way of a solid family story… There is no right answer here, but it’s an interesting question about what you look for in animation. Rather than getting into that debate though, I’m going to return to the idea of animators as directors since it ties to a special event that occurred this week: for the first time since 2014, someone at the studio is being promoted to episode director – Shinpei Sawa, who happens to be one of their best regarded animators by production-savvy fans. One would expect their strongest key animators to move up to animation direction and eventually character designs, as it tends to happen in the industry at large; that is the natural progression, going from drawing scenes to supervising everyone’s cuts, using your experience as animator to understand which keyframes need corrections. And yet this is very consistently not the case. 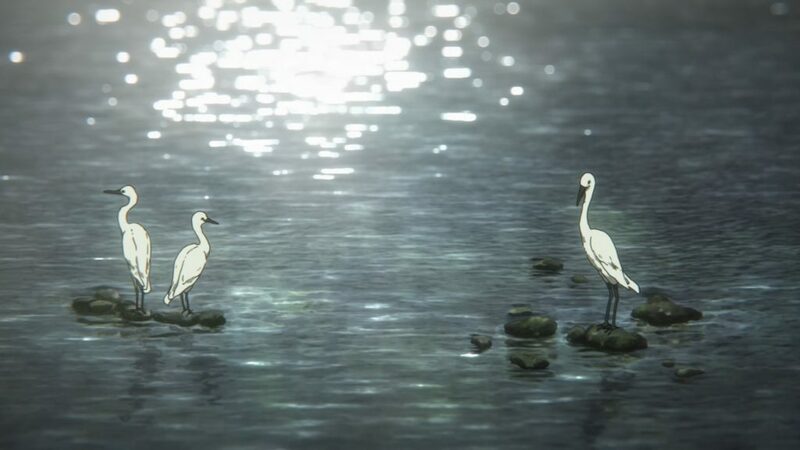 The studio’s widely acknowledged top animators, when given the chance to move up, have all chosen the directional path – Yoshiji Kigami, Taichi Ishidate, Noriyuki Kitanohara, and now Sawa. If I had to make a rough estimate I would say that half the directors in the industry have their roots as animators, with producers being the other major source and roles like photography artists lagging way behind. There isn’t a shortage of directors who started as outstanding key animators either, even legends like Hideaki Anno. But as I said, that’s not the default progression; the easiest way to frame it might be this: everyone can become a director if they make that their goal, but only animators can become animation directors. That, plus the fact that they’re two conceptually closer roles, makes it the most common path for animators rising in the ranks. And yet we have an isolated environment like KyoAni that makes an irregular trend in that regard very easy to appreciate. At this point you might be wondering if this matters at all, or if it’s pure industry trivia. And I would argue that it definitely does, as long as you care about understanding the philosophy of creators and the way the industry functions – which I get the feeling you might, if you’ve made it this far. To keep it as concise as possible, let me formulate my answer to the riddle ‘Why do KyoAni’s best animators choose to become directors?’ with 3 interconnected points. Ambition: The idea that their top key animators majorly end up as directors is true, but there’s a perception trick. People think they’re the best not only because of their impressive draftsmanship, but because they stand out; artists with a voice so strong they become noticeable at the key animation stage are more likely to be capable and want to develop into ambitious creators. On the other hand, similarly talented animators who excel at polishing drawings don’t catch the eye as easily, and those end up as supervisors instead. The ability to breathe life: When it’s the time to become a director, animators have some inherent advantages over other roles. They’ve already spent lots of time figuring out how to make characters move as if they were alive, and this acting knowledge is reflected in the thoroughness of their storyboards. It’s easy to understand why they would be more likely to pass an exam to become directors. Studio Culture: KyoAni’s particularities tie back into these two points. More than anyone else, they value the ability of animating characters in the more profound sense of the word – being able to give them a soul. And at this point, even their recruitment page brings up the ambition to become a director as a positive quality for animators, so the system that consistently makes their most idiosyncratic artists follow that path seems to be working as intended. So what about Shinpei Sawa himself? He actually graduated from the KyoAni School, joining the studio as an in-betweener for K-ON! after finishing their animation course. 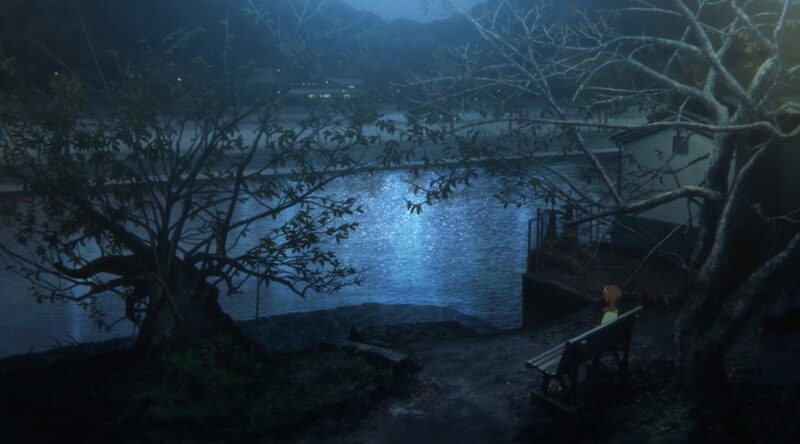 This means that the director who was tutoring him in this episode was also one of his instructors back when he was learning the ropes, which I’m sure must have triggered warm memories for him; Sawa himself has joined Kitanohara on the lineup of KyoAni staff members that teach at the school, so this cycle could repeat itself in the future. Despite his young age he quickly stood out within the studio, often getting trusted with demanding scenes of all kinds. And as much as he can do everything, he’s never hidden his personal preferences: dynamic action, effects animation, and robots if possible! People don’t associate action animation with the studio’s brand, but he’s the perfect example of an artist whose entire career even before going professional is tied to the company and yet happens to excel in that field. He has an eye for detail and strong imagination, so they also let him design all sorts of fantastical creatures and mechanisms when a show regularly requires them. He confessed that it was very touching for him to see the monsters he designed for Phantom World carefully animated, and his comments tend to overflow with the desire to create. There’s no telling how his directional style will develop, but it’s always exciting to see a young creator who adores their job. And while we’re on relative newbies, quite the young lineup on the animation team again! 4 key animators – the most experienced of which joined in 2014 – assisted by Sawa himself, and Mariko Takahashi doing animation clean-up work. All of this supervised by Yuki Tsunoda, who keeps doing solid work despite being still in her first year on that role. The animation was as low-key as everything else, but thorough as usual and another impeccable achievement for an energy conservation episode. Next week I’m actually going to talk about the episode to make up for this! Maybe. Fun fact: Kitanohara joined Kyoto Animation in 1990 (the same year as Kigami, and two years after Ishihara) at age 22 or 23 (he was born in 1967). He’s also become one of those figures that you know will remain at the studio forever, no matter what happens. Stories like him and Sawa going from techer & student to director tutoring are very cute. I’m reminded of what you said about Kitanohara being an “animator first, director later”. I can see what you mean. I’ve seen quite a few clips of Kitanohara’s animation, and a lot of times, it looks like he turns in a full 24 frames per second, making his animation a LOT more fluid than most. Like for example the chase scene in Nichijou Episode 2, Kitanohara used a lot of fast moving animation (24 fps) and a lot of slow moving animation as well.